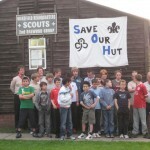 Our principal aim with the Brewood Cycle Challenge has always been to raise as much money as possible to go towards the fund held by the 2nd Brewood Scout Group (charity number 518527) to enable them to buy or build a new scout headquarters or buy the land and renovate its existing building. Our secondary aim has always been to provide a first-class cycling experience for our entrants. We are therefore grateful to receive donations at the event, in the buckets provided, from riders sponsorship or from willing people throughout the year. If you would like to raise sponsorship on our behalf then please print-off the Sponsorship Form and send it, with the money, to us after the event. or … Sponsorship Form Continuation Sheet. If you would like to make a donation, by credit or debit card, then please click on the button below to follow a secure link.